As one of the most respected spiritual explorers of recent times, Ram Dass sparked a revolution with the publication of his 2-million-copy classic, "Be Here Now". Since then, he has been a beacon for spiritual seekers worldwide, challenging us to find new sources of meaning and purpose in our lives. 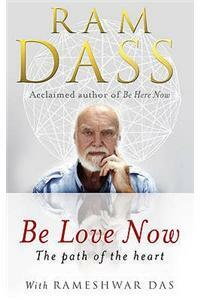 "Be Love Now" is a remarkable blend of autobiography and timeless spiritual insights. From his beginnings as a Harvard psychologist and psychedelic adventurer to his profound encounters with his Indian guru, Neem Karoli Baba, and moving beyond the reawakening brought on by his near-fatal illness, Ram Dass strikes a practical, humorous, soul-stirring chord in today's egotistical and lonely world. While offering us his rich life experiences, he also holds out a timeless, wonderfully universal adventure that will open our hearts and minds.